Small Batch Mavens, like Few Spirits, Koval, North Shore and Journeyman Show off their Spirits at Jerry’s First “Meet Your Chicago Distillers” Expo. 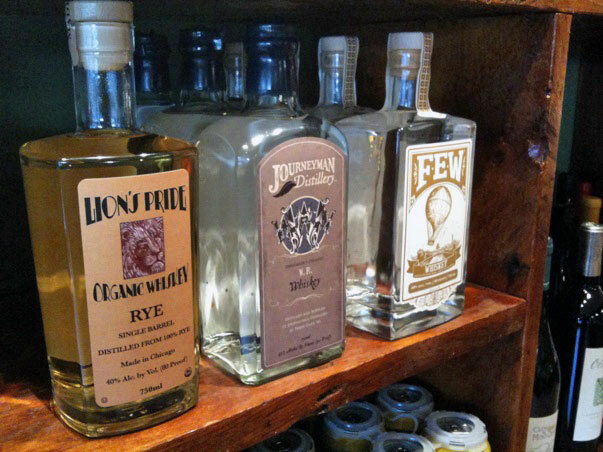 Some of the Chicagoland Distillers who'll be at Jerry's "Meet Your Chicago Distillers" Night: Koval, Journeyman and Few Spirits. This is not a referendum against the charming little city of Lynchburg, Tenn., nor some 99-percenter rant against big liquor. But the truth about booze in the second decade of the 21st century is this: there are great makers of small batch spirits across the country, and several of them are in our backyard. North Shore's signature and renowned vodka. “All the [distillery] representatives are personable and knowledgeable,” said Elder. “They are all fun to be around individually, so collectively, I think it’ll be a very spirited night.” No pun intended. Few Spirits White Whiskey (well, it’s a coin flip between the White Whiskey and their American Gin). Journeyman’s Bilberry Black Hearts Gin. The “Meet Your Distillers” expo at Jerry’s costs $10 to get in, and the price of admittance gets you a specialty cocktail mixed by North Shore’s Leanne Strickler. The event goes from 7-10 PM, although you should probably stick around, as local DJ (and blogger and photographer) Tankboy will be spinning from 10 PM to midnight. We are hoping this results in a classic Soul Train line, and each distiller in the house will pay tribute to Don Cornelius by cutting a rug. “Meet Your Chicago Distillers” takes place at Jerry’s in Wicker Park * 1938 W. Division St. Entry for the event costs $10. Currently there are no advanced tickets — just show up during the night of the event and should get in. Call Jerry’s at 773 235-1006, or visit the event’s Facebook page for more info.